Painted by De Gillett with artist’s pigments, this A4 version is printed with light-fast pigmented inks and laminated for a wipe-clean surface. 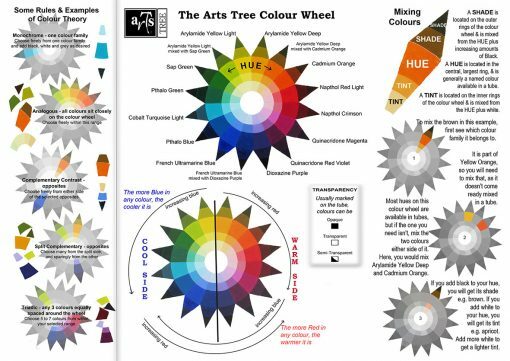 Packed with information presented in practical, visual terms, this document takes you straight to the practical in-studio application of colour knowledge. Made by an artist, for artists! 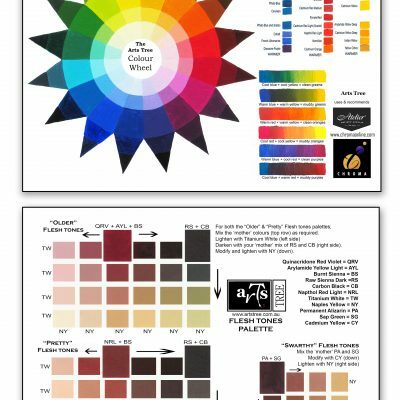 Printed with light-fast inks and laminated to be wipe-clean, this Colour Wheel is the perfect studio companion. De Gillett, a master of colour, used only Atelier Interactive acrylics from Chroma Australia in hand painting this wheel, guaranteeing your ability to obtain the same results when using the same colours. There is a handy breakdown of reds, blues and yellows to help you choose precisely which equivalent named colour to choose if using other brands of paint. The language of working with colour is made clear- hue, tint, shade; transparency and opacity; the ground rules to apply to mix clean or muddy colours as required. Colour scheming with analogous, complementary contrast, monochrome, split-complementary and triadic schemes are demystified, as are the ever-shifting boundaries of cool and warm colours & how they fit together in beautiful, lyrical passages of colour. Limiting your palette is a critical artistic skill, and one which lifts your paintings instantly above the realm of the beginning artist. The wide range of tube colours now available means that the old ideas of starting with primary red, blue and yellow, mixing those to make secondary orange, purple and green, then mixing all those to make tertiary colours is outdated. 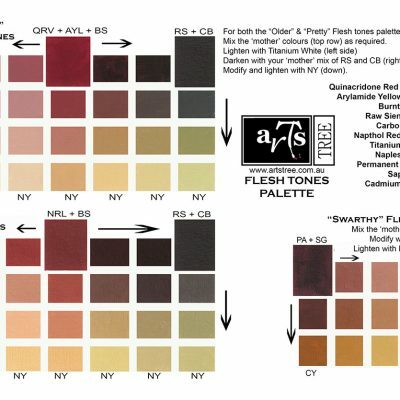 Today’s Colour Wheel must include the newly available Magenta and Turquoise pigments to be complete, & so De has expanded the original 12-point version to include 16 different hues readily available to artists. Never mind wading through the mass of information available out there on colour theory- this handy guide breaks down everything you need to know for easy, practical application in your studio.